Identification: This species has a bright yellow body. The parapodia are margined in white and both the siphon and flagellum are red. Natural history: Siphopteron quadrispinosum is a common diurnal species found on open sand and in Halimeda kanaloana beds at depths of 6-27 m (20-90 ft). Numbers appear every year on open sand in early summer and then decrease until virtually none are seen during the fall, winter and spring. They swim readily when disturbed and lay a flattened, pale yellow egg mass. 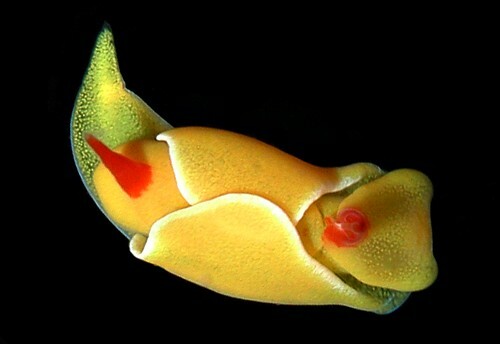 On July 12, 2013 Paul Okumura observed one being eaten by the the sand-dwelling anemone, Mesacmaea sp. (see photos). Taxonomic notes: First recorded in Hawaii from Kihei, Maui by Stan Jazwinski in Oct. 1978. Similar animals from the western Pacific are Siphopteron leah (Ong, et. al. 2017). Photo: CP: 5 mm: Airport Beach, Maui; June 1, 2008.